A pro-Iraq war US congressman who campaigned for French fries to be renamed "freedom fries" is now calling for US troops to return home from Iraq. Republican Representative Walter Jones is to introduce legislation demanding a timetable for the withdrawal. 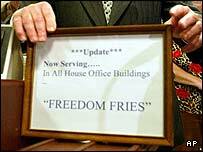 The renaming of fries in Capitol Hill's cafeterias in March 2003 expressed disapproval among some US lawmakers with France's opposition to the war. French toast was also re-branded "freedom toast". "I voted for the resolution to commit the troops, and I feel that we've done about as much as we can do," Mr Jones said on US network ABC. "I just feel that the reason of going in for weapons of mass destruction, the ability of the Iraqis to make a nuclear weapon, that's all been proven that it was never there." He said his change of heart about the war came after he attended the funeral of a US sergeant killed in Nasiriya, Iraq, in April 2003. Mr Jones said he was moved by the soldier's widow who read out her husband's last letter. "And that really has been on my mind and my heart ever since," he said. Mr Jones, who represents North Carolina, has written condolences letters to the families of more than 1,300 servicemen killed in Iraq, and photographs of those killed in action are posted outside his congressional office.